The last wrestler to join the CHIKARA Aniversario pack is the 16th century knight from Camelot himself…Lance Steel! Lance is literally one of the most colorful characters from CHIKARA’s early days. He has quite the interesting history in CHIKARA, which includes forming a tag team with a younger version of himself. That is before beating him and banishing the alternate version of himself to the past. Promoters will have fun recreating some of Lance Steel’s most famous encounters, including the No Time Limit, Falls Count Anywhere match he had against Darkness Crabtree that lasted nearly 24 hours! Of course the arch enemy of a knight is bound to be a dragon, so who can resist booking Lance Steel vs. Dragon Dragon? Lance Steel joins Robbie Ellis, Solo Darling, Travis Huckabee, Darkness Crabtree, Private Eye, and Crummels and Defarge, in this unique 8-pack that showcases the great past and awesome future of CHIKARA. 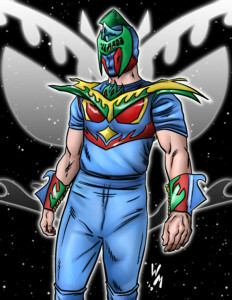 \The CHIKARA Aniversario pack will begin mailing this week, and is available to preorder right now!